This is the front page of my newest website. I made it for the symposium that we hosted last Friday and Saturday. The site holds most of the presentations that were given at the symposium. If you have a fast connection, you can download them to your computer and see what the speakers talked about. If not, don't bother, because the files are huge. They're so large that our regular AWMA San Diego Chapter website didn't have enough space to store them, so I had to go out and buy another site. I used ICD-Soft.com again, of course. In my experience, it's the best deal out there: $65 for 333 MB of space, 5 GB/month transfer rate, your own new domain name, and great service. Who could ask for anything more. Anyway, the dry cooling symposium was qutie a success. 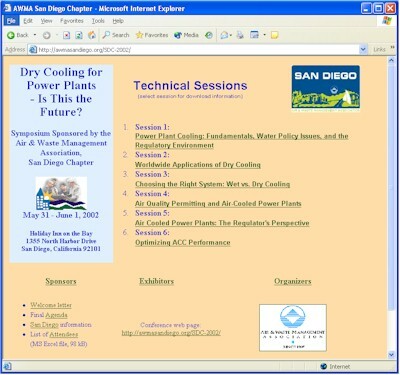 People from all over the world will be downloading the presentations from this site to learn more about how to avoid using lots of water (and killing lots of fish) for the cooling of power plants. And believe me, nobody is going to stop building new power plants for a long time to come. With the ever growing, ever technologically more advanced population on this earth, power demand is going to grow exponentially into the foreseeable future. Go ahead and click on the image to learn about the conference and its presenters. I've included a short biography of everyone who spoke at the conference.